I am excited to join the Scoop on Creating a Handmade Christmas today…and share a little project that I have been planning for a while…my Pottery Barn inspired jingle pillow! If you know me, you know I am a big fat copy cat! Sooo…as soon as I saw Pottery Barn’s Jingle Lumbar Pillow, I knew I had found my next project! We have had nothing but rain here and I’m afraid that my staff is getting bored, so a fun little project will be just what the doctor ordered! Cut the front of the burlap pillow cover 1 inch wider and longer than your pillow cover. My pillow insert was 13 in. x 20 in. so I cut the cover front at 14 in. x 21 in. Next, follow the directions that you find here to measure and cut the pieces for the envelope-style pillow closure for the back. Print the “jingle” graphic above in 8 x 10 size. I use Photoscape (a free download) so that I can more easily control the size of the graphics. Turn over the jingle graphic and thoroughly cover the back of the word with artist’s charcoal. You are creating your own carbon paper. Find the center of the cover front and pin the jingle graphic in place, with the charcoal side facing the burlap, centered and equally spaced from all sides. Then trace around the graphic, bearing down relatively hard and filling in the solid sections as well. I found that a ball point pen worked best for this. When you have traced and filled in all the letters, remove the paper. Using a red Sharpie pen, draw in the outline of the letter. This gives you a little margin to work with when you start to paint. With a small brush, paint in the inner portions of the letter with red craft paint. Take your time and work carefully. Then if you wish, using the Pottery Barn photo as your guide, add a few flourishes to the graphic to complete the look. Let it dry. Then, following the instructions found here, sew the back pieces to the front, turn inside out and press…and your pillow cover is ready to add the final touches! …like my farmhouse Christmas mantel! The wreath and the stockings were all handmade as well. You can see more, including a link to the tutorial for making your own cuffed stockings, by clicking here. And I have also shared my easy and inexpensive salt shaker snow globes…more farmhouse fun! Wouldn’t they make cute little gifts? You can see how I made them here. And if you would like even more ideas for easy and inexpensive handmade Christmas gifts, just click here. I am sharing a few of my projects that would make great gifts…and are easy to make while being easy on the budget as well! There’s a little bit of everything here…from no-sew to light sewing, some painting, a little cutting and gluing and some iron-on transfers! I have to say that there’s nothing like getting a gift that was handmade…it really makes it extra special! Thanks for stopping by! I hope you enjoyed my jingle pillow! Please visit these wonderful bloggers and their beautiful blogs to see what they are up to and to find a list of this week’s participants! You are so talented, Debbie. I always love seeing what you do! This is wonderful, Debbie! You are the best copycat! : ) Love how you even added the flourishes like the PB one. You create the best pillows, Debbie- love it! This is so cute Debbie!! I had to really search where to comment but it was worth it because this is a fantastic copy. I could do this. You make things looks so easy while copying really neat things. 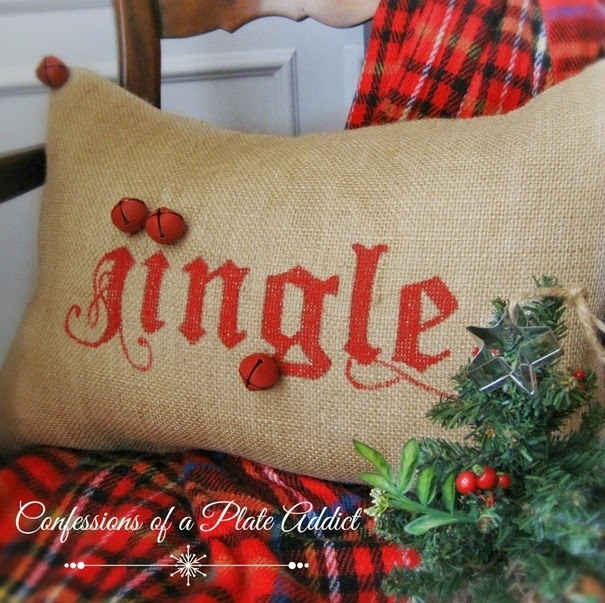 The jingle pillow is the best holiday pillow I've seen! And your mantel is fabulous! Debbie, you are such a favorite! I love learning from you and looking at your photos. You are truly such a great talent! Love the fireplace mantle.....it's wonderful! the best I've seen! Love your knockoff pillow... it would go great with my knockoff Peace Love Joy Pottery Barn knockoff. Too cute! Very nice Debbie! I love this pillow, as I do all of your projects. So when are you changing your name to pillow addict, and how many pillows do you have now? I love your jingle pillow! !...and your mantel too!! I love Pottery Barn and I keep all their catalogs to get ideas for my home. Great PB copy! You did a fantastic job, and it looks great with your farmhouse theme. My post with the Eiffel Tower book covers, following your directions, is live now. I am so honored to be on The Scoop on Creating a Handmade Christmas tour with all of you talented creative ones. You always have the best pillows!!! It looks amazing, nothing short to the PB one. And do you live with a tiger??? That picture of your cat was gorgeous. So cute! I love the added bells. Who doesn't love a great PB knock-off! Great job! I love it, Debbie. It's identical to the real thing! I love this, totally adding it to my to do list, thanks for sharing!! Another successful copcat! Love the bells as that finishing touch. I want to do a PB knock off of a red PEACE pillow cover that I saw in their catalog. I need to get busy! It's was fun being on the tour with you...Happy Holidays! I love this pillow! You did a beautiful job, so wish I had some burlap laying around to make one of these! You must have a million pillow covers! I love them ALL! I love your mantle (and everything else too!)!!! Where did you find the gorgeous ribbon on your wreath? This is so good, love this! Thanks for sharing this.Merry Christmas and Happy New Year.